What others should know: Look at the bullet styles for accuracy. I am still searching for a better hunting projectile. Air Venturi lead is excellent for targets only it seems. Things I liked: Consistency in size, weight, & shape. Things I would have changed: Make them swaged. What others should know: They 'appear' to be cast, e.g., have sprue area (i.e., a flat spot) from a mold. This can affect accuracy and/or consistency if that spot is not placed consistently in the bore/breech from shot to shot. Things I would have changed: These are only good for plinking. Many flat spots and are in no way an accurate round. 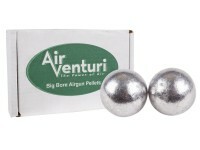 I use in a Air Venturi Wing ShotII. Smooth bore. What others should know: Dont expect an accurate round. I have a wingshot as well... was considering these. If these really didn’t perform well, did you find one that did? Can you use muzzleloader ammunition in the .50 cal?? Or suggestions for something that is a little softer or that does some kind of reaction to contact? I have no complaints, just wandering if there is another piece of lead that at least mushrooms or something..
What app. can I get the FPE at distances of various yardage. With 177 round ball I'm using in my Dragon Claw.